For our down-time after the rest of our Antarctic and Patagonia trip we chose Uruguay and spent 5 days here generally doing nothing apart from going out to eat in the evening. Uruguay is much more expensive than Argentina. I didi get the eat the best rabbit I have ever tasted here. Big and spatchcocked, like it had been run over. This was out hotel, the beautiful Serena about 4 miles around the bay from the lighthouse. It was a super place to chill out with great bed loungers on the beach and a cool freshwater pool as well. 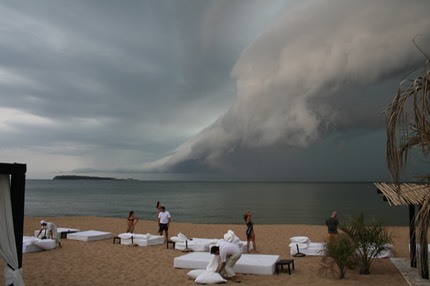 On the second night a huge storm blew up and looked incredibly imposing as it closed in on the beach. Within seconds of this photo being taken it hit the beach and started hurling the furniture off the beach.